The Installation Summary screen is the central location for setting up an installation. 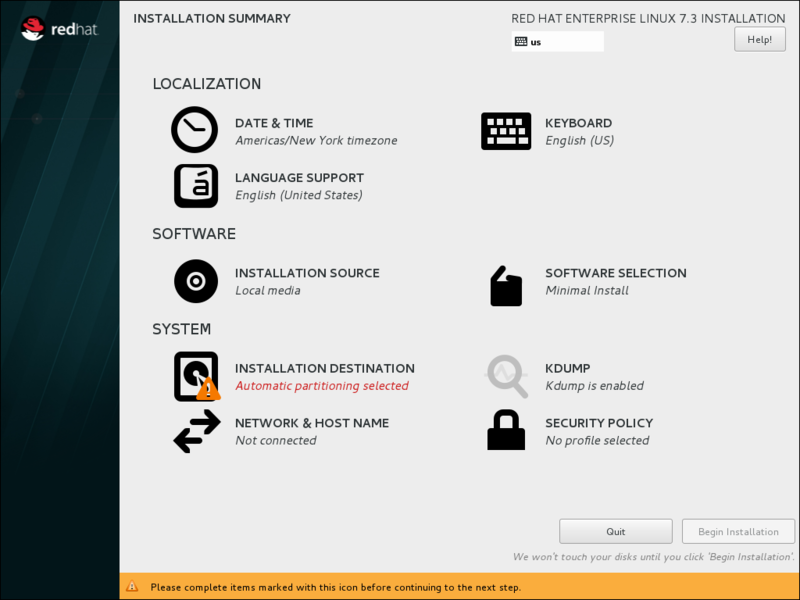 Instead of directing you through consecutive screens, the Red Hat Enterprise Linux installation program allows you to configure your installation in the order you choose. Use your mouse to select a menu item to configure a section of the installation. When you have completed configuring a section, or if you would like to complete that section later, click the Done button located in the upper left corner of the screen. Only sections marked with a warning symbol are mandatory. A note at the bottom of the screen warns you that these sections must be completed before the installation can begin. The remaining sections are optional. Beneath each section's title, the current configuration is summarized. Using this you can determine whether you need to visit the section to configure it further. Once all required sections are complete, click the Begin Installation button. Also see Section 8.17, “Begin Installation”. To cancel the installation, click the Quit button. When related background tasks are running, certain menu items might be temporarily unavailable. 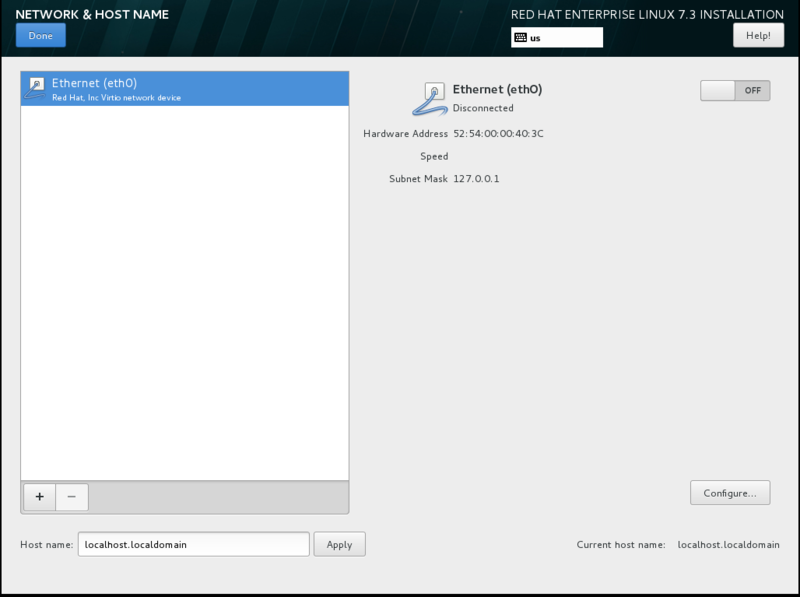 If you used a Kickstart option or a boot command-line option to specify an installation repository on a network, but no network is available at the start of the installation, the installation program will display the configuration screen for you to set up a network connection prior to displaying the Installation Summary screen. You can skip this step if you are installing from an installation DVD or other locally accessible media, and you are certain you will not need network to finish the installation. However, network connectivity is necessary for network installations (see Section 8.11, “Installation Source”) or for setting up advanced storage devices (see Section 8.15, “Storage Devices”). For more details about configuring a network in the installation program, see Section 8.12, “Network & Hostname”.